I love hearts! Hearts are a default decorative element on my pages, especially when the pages focus on my kids. So, how do I use hearts on my pages with out them all looking the same? After all, there are only two heart shape options to choose from in Photoshop and Photoshop Elements. The answer is to create my own! It’s easy to modify the basic heart shape into more creative, whimsical versions using basic tools. Once you have made a fun new heart shape, there many things that you can do with them. Use a filter on the heart. Fill the heart with a pattern. Fill the heart with a style. Clip one of your favorite papers to the heart shape and add a stroke in a contrasting color to define the shape even more. Change the color and opacity of the heart shape to make a vellum element. 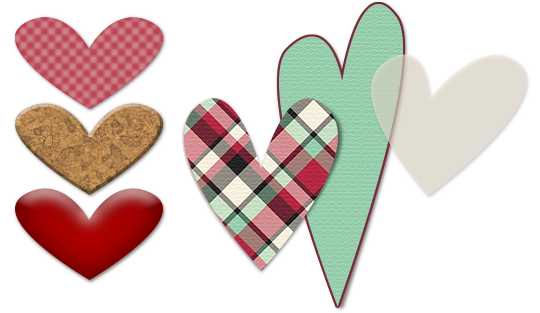 Define a brush from the heart shape and vary the brush settings to create fun borders and backgrounds. I like to use as many of the colors and patterns from a kit as possible, but that can easily become overwhelming and distract from the photo. By using the heart shapes as clipping masks in the layout below, I pulled in more of the kit papers without too much distraction from the main subject–the beautiful embrace of mother and child! I also added a coordinating stroke outline to define each heart. Click on the video below to learn how to take Photoshop’s heart shape to the next level. Use simple transformation options to create fun, whimsical additions to your scrapbook pages. This video tutorial was originally recorded by Christina Rambo in September of 2012. I so enjoyed your tutorial “whimsical heart” and was surprised at how easy it was to do. Now going to give this a go myself. Thanks Again Christina. It’s really such a simple idea, but I never thought of doing this. Thank you! Loved your information. I love funky shaped hearts so this was perfect – I will give it a try!